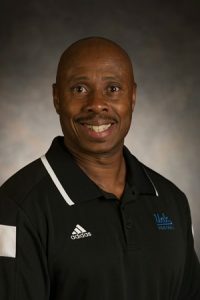 After five years at UCLA, wide receivers coach Eric Yarber will return to the NFL, sources confirmed Thursday. Yarber, 53, is expected to join the Los Angeles Rams as the wide receivers coach. The news was first reported by Bruin Report Online. Prior to joining UCLA’s staff in 2012, Yarber coached receivers with the Tampa Bay Buccaneers for two seasons. He has five years of NFL coaching experience overall. His contract with UCLA still had a season on it. After UCLA’s abysmal offensive year in 2016, the only offensive coach remaining under new offensive coordinator Jedd Fisch from a year ago is tight ends coach Rip Scherer. Former quarterbacks coach Marques Tuiasosopo left for the same position at California, while former offensive line coach Adrian Klemm was fired in January. Former offensive coordinator and running backs coach Kennedy Polamalu was fired in November, one day after the season ended. UCLA recently hired offensive line coach Hank Fraley and running backs coach DeShaun Foster. In his five years at UCLA, Yarber coached several NFL draft picks, including the school’s all-time leader in receptions Jordan Payton, a fifth-round selection in the 2016 draft. Yarber pulled in four-star receivers Theo Howard and Demteric Felton in the 2016 recruiting class, but failed to reel in a single receiver for the 2017 class, which was announced Wednesday. According to the Minnesota Star Tribune, UCLA will also add former Minnesota quarterback Adam Weber as an offensive analyst. Weber, 29, worked as a graduate assistant for the Gophers for the previous two years. He played for Minnesota under Fisch during the 2009 season and ended his career as the school’s all-time leading passer. Staff reporter Jack Wang contributed to this story. Receivers coach Eric Yarber talks about how his receiver can help in the run game, how much of Theo Howard you can expect this week and the “you-to-me factor” between his receivers and Mike Fafaul now. Defensive coordinator Tom Bradley talks about the progress of the defense, his group’s performance against BYU and the role the secondary plays in the pass rush. Receivers coach Eric Yarber talks about Darren Andrews, Jordan Lasley and Theo Howard. Defensive line coach Angus McClure talks about stopping Christian McCaffrey, Matt Dickerson and how stopping BYU affected the mentality of the defense. Receivers coach Eric Yarber talks to the media about the progress of his receivers, how Darren Andrews may fly under the radar and the progression of Theo Howard.